Possessing a rare combination of wisdom and humility, while serenely dominating your environment you selflessly use your powers to care for others. Galadriel is a character in the Middle-Earth universe. 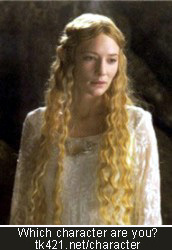 You can read more about her at the Galadriel Worshippers Army.